This is my first time to do the The Cat's Pajamas challenge. This Summery Color Challenge was a fun project. 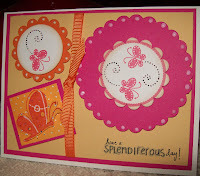 The colors I used were Papertrey's Raspberry Fizz, Stampin' Ups Pumpkin Pie and So Saffron (yellow). The images were from Papertrey's Tags for Spring, Stampim' Ups Garden Whimsey, and A-Muse's Splendiferous Day. The punches I used were also varied -- Stampin' Up's scallop circle and Marvy's larger scallop circle and Stampin' Ups circle punch. I used Stampin' Ups Pumpkin Pie grograin ribbon. Dimensionals added depth to each image. White cardstock was used as the base with layers of the Raspberry, Orange and Yellow colors. The dots were done with 3-D paint. I hope you enjoy seeing this card as much as I did doing it. I think I might just do another challenge!! Yeah Mom...a challenge!!!!! It looks great! I love the colors...I happen to be working with those colors now too!!! Well, along with a few others as well. see? that wasn't so challenging, now was it?!?! a lot of people were "afraid" of these colors. i don't get it. they are so FUN!! your card turned out so sweet and i hope to see you play in more challenges! go, mom! Linda, welcome to the TCP challenge, you did an amazing job with this bright colors; am loving the images and the layout you used that plays nicely with the PP. Great job! What a great card! Thank you for playing!